Boston had its Brahmins, Philadelphia its Main Line, and Virginia its First Families; however, the upper class of New York, unlike those venerable cities, did not remain unassailed and unsullied by nouveaux riche. No, New York was different, and its constant injection of fresh blood into the upper classes was mirrored in the general atmosphere of the city. New York was the pinnacle of America’s “melting pot,” and never more was this true for the old Colonial and Knickerbocker society. Colonized first by the Dutch and later by the English, New York society of the first half of the 19th century was rather sedate; staid almost. This close-knit community, bound together by family ties and mutual veneration of bloodlines that stretched to the earliest settlers, clustered towards the bottom of Fifth Avenue in neat rows of brownstones Edith Wharton described as “coat[ing] New York like a cold chocolate sauce.” Their days and nights were ruled by customs and mores no one dared to break lest they find themselves ostracized. From this coterie emerged Mrs. William Backhouse Astor Jr. Caroline Astor, known as “Lina” to her intimates, was born a Schermerhorn, and was firmly entrenched in the Knickerbocracy. Her rein on society was light before the Civil War, which allowed her ample time to devote herself to raising her five children and running her household. After the war everything changed. Not only were scores of the newly rich clamoring to enter Society, but Caroline was embroiled in a family feud for supremacy that culminated three decades later in the founding of the opulent Waldorf-Astoria. Caroline was known as “Mrs. William Astor” until her sister-in-law’s death in 1887, whereupon she promptly considered herself the most senior female family member and became simply “Mrs. Astor.” Her nephew William Waldorf Astor, as the son of the elder brother of Caroline’s husband, felt his wife should be “Mrs. Astor.” The gleeful press egged on the battle and in their clippings added the infamous article that made the Mrs. Astor remain imprinted forever in history. W.W. Astor, smarting from this loss and the political losses he attempted, decamped to England–but not without the last laugh. Caroline had migrated up Fifth Avenue as fashion dictated, but had yet to move even further up the avenue where fashionable society had gone to build their magnificent urban chateaux. To her horror she watched as her nephew’s adjoining mansion was torn down and a hotel built in its place. She moved to a new mansion built by Richard Morris Hunt a few years later, and the brownstone in which she’d lived was demolished for an accompanying hotel built beside the Waldorf. Her side was named the Astoria, and despite the hyphen in the name and the connecting passageway, they remained unerringly separate entities. While this family feud played out, Caroline was determined to keep newcomers out of New York society. Aiding her in this goal was the debonair Ward McAllister, a member of a prominent Savannah family and a man-about-town. 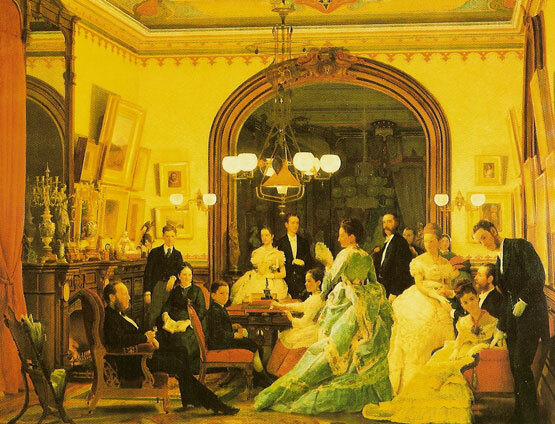 It was he who coined the social index “Four Hundred”–a reference to the people who mattered in society, and the number of guests who could fit into Mrs. Astor’s ballroom. The press noted sarcastically that his list fell short of 400, but the name caught on, and soon every new millionaire who entered the city wanted to be on that list. As Mrs. Astor’s courtier, McAllister set about molding and shaping upper-class New York society, determining who was in and who was out, what was correct and what was not, and those whom Mrs Astor would accept and those whom she would not–but he was no match for the newly-married Alva Vanderbilt. Until the uncouth, foul-mouthed Commodore (Cornelius) Vanderbilt died, no member of the Vanderbilt family was accepted into the Four Hundred. Some of the younger members were able to participate in the less intimate entertainments, but being invited to the Mrs Astor’s annual ball? Nope. The Vanderbilts and a few other nouveaux riche families scored a social coup when they built the Metropolitan Opera House to rival the exclusive Academy of Music, but they met roadblocks in every other avenue. A windfall fell into their lap when William Kissam Vanderbilt married the tenacious Alva Erskine Smith in 1875. With the Vanderbilt millions at her disposal, she pushed the family into social prominence. The Vanderbilts astonished everyone by their rapid house-building, by the opulent European architectural styles and treasures imported to America, and particularly by their boldness in building quite far up Fifth Avenue. Alva threw down the gauntlet when she planned an enormous house-warming costume ball complete with expensive favors and elaborate quadrilles. For weeks everyone buzzed excitedly about what they would wear, the food they would eat, and the dances they would execute. No one was more excited than Caroline Astor’s favorite daughter Carrie, who was to take part in the Star Quadrille. Meanwhile, the antics of Ward McAllister grew grating. He began to make a habit of speaking to the press about the inner workings of New York society, and in his overweening pride he elevated himself not as courtier to Mrs Astor, but as the absolute authority on what made up good society. He overreached himself in 1890 when he had the temerity of not only writing a book about the Four Hundred, but publishing it! His memoir, Society As I Have Found It, made McAllister look like a pompous fool, and the society he had created as self-conscious, undemocratic and arrogant. The press had a field day in repeating McAllister’s bloated dictates, and New York retaliated by closing its doors to him. McAllister tripped along after this setback, but when his bombastic insult of Chicago society while the city hosted the World’s Fair was met with stony silence, his time was up. When he died in 1895, barely any of his friends could be bothered to attend his funeral and he no longer existed to Mrs Astor, who tellingly didn’t think of canceling a dinner party scheduled that same night. He married a wealthy widow from the Drexel family to supplement his lack of income, and became indispensable to New York hostesses. According to his wife Elizabeth, he “chose their dresses for them, planned their house parties, taught them how to manage their love affairs, and found them husbands.” As Mrs. Astor’s power, influence and health waned, Harry migrated to Mrs Stuyvesant Fish, better known as Mamie, who was more his style. The two quickly embarked on their “bloodless reign of terror,” where dinners with monkeys, on horses, dressed as servants, and hosted by fake royals destroyed the sedate pace that characterized Caroline Astor’s rule. Co-rulers with Mamie were Mrs Hermann Oelrichs, the former Theresa Fair and a Comstock Lode heiress, and Mrs. O.H.P. Belmont, better known as the former Alva Vanderbilt (div W.K. 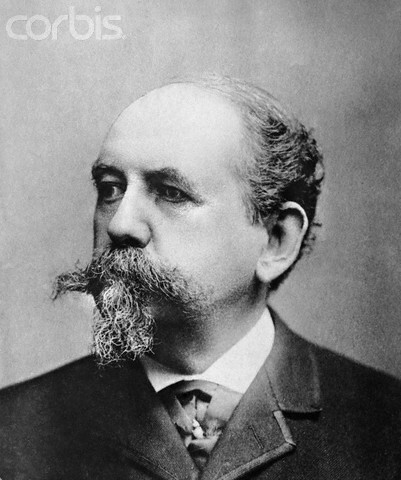 Vanderbilt in 1896). 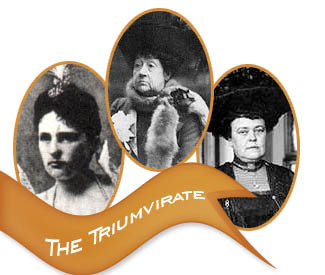 These three women made up what was known as “The Triumvirate” and under their aegis, the Four Hundred reached its apogee. Caroline Astor’s death in 1908 marked a general decline in society. She slipped away quietly, but her absence was felt nonetheless. From as far away as Texas, journalists like William Cowper Brann, filled newspaper columns condemning the excesses of the Four Hundred and the multitude of cities who strove to emulate them. Colonel William d’Alton Mann, who owned the gossip magazine Town Topics, considered it his duty to expose the sins of society–while doing a little blackmail on the side. However, without the Mrs Astor, the Four Hundred lacked a focal point and began to split into dozens of overlapping cliques. Oh, the Four Hundred remained exclusive, but longtime staples such as summers in Newport and autumns in the Berkshires were no longer as regulated and rigidly scheduled, nor were they de rigueur for being a part of the society. By the mid-1910s, the old standards for what constituted society began to loosen and shift, paving the way for the Café Society of the 1920s and ’30s. Thanks for all the great Gilded Age articles. Harry Lehr is a very intersting person. Anyone have the original copy of his wife’s book with pictures ? “So this is good old Boston. The home of the bean and the cod. Interesting pieces. I am currently living a year as a 1955 homemaker. Thanks for stopping by Alastair and 50s gal! Does anyone know anything about Harry Lehr that wasn’t in his wife’s book ?